Regular contributor Kathy Morelli takes a look at babies and media and technology exposure. If you are working with expectant families or with families parenting young children, you have an opportunity to share the impact of media on developing brains. Take a moment to read today's post and share how you bring up this topic with the families you work with. - Sharon Muza, Community Manager, Science & Sensibility. 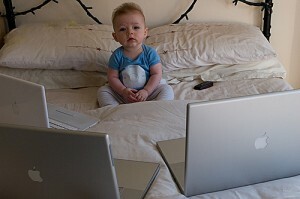 Today's babies are definitely digital natives! They grow up in a world saturated by media. The research about the effects of media on child development is in its infancy (no pun intended). On one hand, some research suggests when the developing brain is over-exposed to multi-tasking, attentional and learning difficulties can result. On the other hand, other research contradicts this finding. Additionally, there are lots of claims from DVD and TV producers that using their media enhances learning and social growth. What's a parent to believe? Put some perspective on this issue by reframing parenting around media issues as similar to parenting around other issues. Parenting with awareness and moderation through the infant years, around any topic, depends on three important tips. Encourage parents to be aware of their own emotional reactions to their baby. Have them own their emotions as their own, not their baby's. If the parents themselves have felt abandoned as a child, they may need to do their own hard emotional work, centering on their reactions to their baby's dependency needs. Feelings around their own issues persist no matter what media is in use in the house. Parents should recognize them as their own feelings and work to own them. All the statistics and information in the world doesn't change the fact that each baby is an individual, with individual needs. All babies need one-on-one attention from their caregivers, but some need more than others. Some babies cry more than others, some have colic, some are calmer and quieter than others. And learning occurs differently in each individual. Have the parents look for clues. If their baby needs more attention than they think he needs, remember he is an individual and cannot be compared to other babies in their life. If their baby has a negative reaction to some type of media, have the parents either reduce its use or don't use it at all. It might be a signal that he needs more interactive attention from the parent. If the baby seems confused, frightened or agitated by some imagery or sounds from media, don't force him to watch it. Cut it out of the home's media diet. There is no substitute for the parents. Have parents plan to spend meaningful time with their baby. A baby's healthy development depends on attentive, personal, touchable, multisensorial, fully embodied experiences. First, an infant's growth is intertwined on all levels; physical, mental and emotional growth are all related. In other words, brain development, movement, emotional development, and language are all inter-related and unfold together, at a biologically prescribed pace. Second, in the first three years of life, there are multiple critical periods (windows of opportunity) when a baby must be exposed to particular life experiences in order to learn particular skills. If these windows are missed, it's extremely hard (or impossible) to learn the skill at a later time in life. The windows of opportunity are biologically based on brain development (Zero to Three, 2012). For example, vision and language are two skills dependent on critical windows of time. Acquisition of binocular vision and depth perception depends on a normal early experience with vision in the first few weeks of life. Language skills must be acquired before five years of age, or there is little chance of developing language later in life (Zero to Three, 2012). Third, babies are born with immature brains. Experts estimate in order for the human brain to be fully developed at birth, the gestational period should be 18 months. But human babies come out in nine months in order to compensate for the size of the human female pelvis (Christakis, 2009). Many baby experts refer to the first three months of life as the "fourth trimester" (Karp, 2003). In the fourth trimester, a baby is still very fetus-like. At at the beginning of life, a baby's brain is only a quarter of its adult size and will grow about 20% in just the first three months of life. Her brain structures are in place, but are waiting to grow, based on her experiences. (Stamm, 2007). Think of the huge differences between a four day old baby and a four month old baby. That four month old child is cooing and smiling right at their parents, enticing them to connect! That newborn is depending on the parents to connect with her to help her grow (Marvin & Britner, 2008). Babies Learn by Social Interaction: Popular hype says any type of stimulation helps the infant brain grow and learn. But the consensus of child development specialists everywhere is normal infant development depends on normal social stimulation involving all the senses (touch, sound, sight, smell) (Vygotsky, 1978; as cited in Fenstermacher et al, 2010). What is normal social stimulation with all the senses? It is responsive care by the parents (caregivers) using all the senses, including skin to skin contact, movement (swaying, walking, gentle dancing), holding, feeding, cuddling, talking, loving direct eye contact, smiles, gentle play, comforting, and mature acceptance and modulation of your baby's changing feeling states (angry, happy, sad) (Cozolino, 2006; Wallin, 2007). Emotional Attachment Style is Learned: A baby's emotional template is encoded neurologically based on her earliest experiences with her parents and other caregivers. The biological attachment sequence enacts no matter what type of care a baby receives. A good quality, secure attachment is created by good quality and consistent interactions between baby and parents. The human brain is plastic, so the attachment template is continuously updated and developed throughout life, but it is much easier on a person to begin life with healthy connectivity patterns, than to correct them as they go along (Wallin, 2007). Neglect & Abuse Affect Brain Growth: Research shows children growing up in neglectful and abusive homes, who are rarely spoken to, who do not have the opportunity to explore, may fail to develop the neuronal pathways necessary to learning (Zero to Three, 2012). No Media vs Hey, It's Educational! Parents of the under two set are understandably concerned by the conflicting messages out there about screen time. American Academy of Pediatrics (AAP, 2011) strongly discourages any media consumption by children younger than two. The AAP's policy statement is based on research findings that media time tends to elbow out time spent in unstructured, creative play time and interactive activities with a parent or caregiver. High quality, multi-sensorial interactions with a consistent caregiver are essential for healthy child development. Yet, media is an integral part of our culture. On the average, 100% of children under two watch 1 - 2 hours of media every day and 14% watch over 2 hours a day (AAP, 2011). 40% of all children younger than two years live in households where the TV is on all day long as background noise (Courage & Setcliff, 2009). So what's a parent to believe? Does media consumption hurt babies? Many parents say they are comfortable with allowing their under 12 month babies to watch educational media. There are a lot of educational firms pushing DVDs for the under 12 month old set, claiming learning enhancement and improvement for school readiness. Are their claims substantiated by research? What follows are some key points from the research about media consumption, learning and attentional effects on the developing brain. In 2004, Dimitri Christakis, MD, MPH of the University of Washington, reviewed data from an existing study. He found an association between children under three who watch on average more than two hours a day of television and attentional difficulties. In 2007, further studies by Christakis and his colleague, Fred Zimmerman, found the attentional difficulties were more precisely linked to program content. That is, cartoons and fast paced media seem to be linked to attentional difficulties, but not educational and appropriately paced programs. Christakis theorizes that over-stimulation of the developing brain with flashing and changing sights and sounds might be harmful to the developing brain (Christakis and Zimmerman, 2007; Christakis, 2009; Zimmerman et al, 2009). On the other hand, there are researchers such as Tara Stevens and Miriam Muslow (2006) who feel the evidence linking media usage and attentional difficulties is highly correlational and Christakis and Zimmerman did not properly account for other factors in their information. Clearly, there is a need for the National Institute of Health to fund a large scale study to see if and how the digital native brain is affected by media saturation. Video Deficit Effect: Research about screen learning versus live learning indicates infants learn less from video than from live interactions; this is called the "video deficit effect." The video deficit effect persists to about three years of age (Barr, Muentener, & Garcia, 2007; Zack et al, 2009). The video deficit effect is mitigated by repetitive viewings, media content design and the context in which the media is used (Barr, 2010). Repetition: So, babies under 12 months will retain behavior after seeing it performed once by a live model. But it takes repeated viewings for a baby to learn the same behavior from a screen. Content design: Retention of information is also enhanced in the under 12 month set by story content. If the story lines are simple, in sequence, and uninterrupted by multiple story lines or commercials, retention is enhanced. (think Teletubbies). Context: In addition, if the media is in the context of a family situation, that is, if there is an appropriate adult moderator present, to discuss, distract and limit screen use, retention is enhanced and deleterious effects are reduced (Christakis, 2009). Individual learning differences: In addition, there are differences in how and how fast individual babies learn. In general, at about the age of 12 months, a child becomes capable of seeing something on a screen and then performing it himself. But there are individual variations, and these variations persist into toddlerhood (Barr, 2007). But, as discussed above, child development specialists agree infants primarily learn via social-interactional-sensorial methods. Let's take a look at the claims made by current educational DVDs targeted at infants. In 2010, Susan Fenstermacher and her colleagues conducted an overview of 58 popular DVDs (culled from a total of 218 made between Fall 2007 and Spring 2008) marketed as educational to parents for their infants. A total of 17% of 686 claims made by the producers were that the DVDs provide socio-emotional educational content. However, the researchers found that only 4% of all the scenes were socio-interactional in content and these scenes were not of high quality. In general, producers of DVDs do not use research-based child development learning principles, despite their claims. Of course this may be changing as these producers begin to use child development experts as content consultants. Language: Research shows babies learn language from being directly spoken to by their caregivers. Babies don't learn language from the television or from observing conversations between adults, they need direct attention. Matthew LaPierre and his colleagues (2012) found that children from eight months to eight years are exposed to over 4 hours of TV a day. This can be reduced by not having a TV in the child's room. Studies have shown that having the television on at home all day as background noise causes language delays and reduced interaction between parents and children (Kirkorian et al, 2012; LaPierre, Piotrowski & Linebarger, 2012). Profoundly, a study of 1000 infants found that babies who watched over 2 hours of DVDs a day had poorer language assessments than babies who did not watch DVDs. Specifically, for each hour of watching a DVD, a baby knew 6 - 8 words less than babies who did not watch DVDs (Christakis & Zimmerman, 2007). On the other hand, in 2010, Allen and Scofield found that 2 year olds can learn simple words from very simplified content, from a video. They found the Blues Clues format was good for this. Again, the research is not yet complete, but still points to the benefits of parental awareness and judicious use of media. Remember babies brain structures are not yet developed. The lower brain centers, the emotional centers, with structures such as the amygdala, are fully formed at birth. The amygdala is in charge of emotional designation. But the neo-cortex, the logic center is not fully formed until the early twenties (Cozolino,2006). Thus, the capacity to differentiate between fantasy and reality is limited in babies, toddlers and children. Babies are wired to empathize with the emotions of the people around them and have the capacity to do so. And remember that babies do retain information from repeated viewings. For an example of how differently children view reality than adults, studies show children believe that many planes hit the World Trade Center, not just two, as the event was shown over and over again on TV. So keep in mind babies/toddlers and adults have a different understanding about fantasy and reality as applied to what is viewed on the screen and they also can "catch" emotions from the people around them and from the screen. So, when it comes to media consumption, think about parenting a young baby with awareness and moderation. Some age appropriate media is ok, and its ok to for parents to take breaks with a TV show, but don't let it edge out stroller walks, hikes in a baby back pack in the woods, and bonding time. Tip One: There is no substitute for the parent. Studies indicate using media over 2 hours a day steals precious interactional learning time from the baby. Encourage parents to help their baby grow by being present with her. Tip Two: Like any parenting decision that needs to be made, make the decision from a place of awareness and in moderation. Tip Three: Be aware of how much your TV is on. Again, research has found that children in the US are exposed to over 4 hours of TV a day. Reduce this time limiting the number of TV's in the home, and not putting a TV or computer in the child's bedroom. Tip Four: Those educational DVDs? Well, research shows they make a lot of claims and the content is not based on research. Since some studies have implicated attentional and language deficits in babies who view more than two hours of media per day, limit the amount of media with your infant. A baby's primitive brain learns socially and with many senses involved: touch, smell, sight, sound. A baby's early interactions and experiences are encoded in the brain and have lasting effects. Choose media that has child development consultants working on the production. Tip Five: Think twice about exposing your young baby/toddler to violent imagery on the screen. Remember repetitive showings increase retention, babies are naturally wired to empathize with emotions and studies show that children have a different perception of reality and fantasy than adults. Teach her to regulate her emotional states by appropriately soothing her when necessary. She is learning how to accept and tolerate her own emotional states from parents, so remain calm and consistent. Remind parents that they don't need to be perfect, they just need to be good enough! Barr, R, Muentener, P, and Garcia, A. (2007). Age related changes in deferred imitation from television by 6-18-month-olds. Developmental Science,10(6), 910-922. Christakis, D (2009). The effects of infant media usage: what do we know and what should we learn? Acta PÃ¦diatrica, 98, 8-16. Courage, M. and Setliff, (2009). Debating the impact of television and video material on very young children: Attention, learning, and the developing brain. Society for Research in Child Development, 3(1), 72-78. Field, T., Hernandez-Reif, M., & Diego, M. (2006). Newborns of depressed mothers who received moderate versus light pressure massage during pregnancy. Infant Behavior and Development, 29,54-58. Kirkorian, H. L., Pempek, T. A., Murphy, L. A., Schmidt, M. E., & Anderson, D. R. (2009). The Impact of Background Television on Parent-Child Interaction. Child Development, 80(5), 1350-1359. doi:10.1111/j.1467-8624.2009.01337.x. LaPierre, M., Piotrowski, J., and Linebarger, D. (2012). American children exposed to high amounts of harmful TV. Unpublished paper presented at International Communication Association's annual conference (Phoenix, AZ, May 24-28, 2012). Marvin, R.S. & Britner, P.A. (2008). Normative Development: The ontogeny of attachment. In J. Cassidy & P.R. Shaw (Eds), Handbook of Attachment, (pp. 269-294). New York: The Guilford Press. Stamm, J. (2007). Bright from the start. New York: Penguin Books. Wallin,D.J. (2007). Attachment in psychotherapy. New York: The Guilford Press. Zack, E., Barr, R., Gerhardstein, P., Dickerson, K., and Meltzoff, A.N. (2009). Infant imitation from television using novel touchscreen technology. British Journal of Developmental Psychology, 27, 13-26.